Seven-time Eclipse Award-winning trainer Todd Pletcher, a former assistant to legendary Hall of Famer D. Wayne Lukas from 1989-95, will attempt to land the race named in his mentor’s honor on Saturday when Mylute invades from New York for the third running of the $175,000 Lukas Classic (Listed) at Churchill Downs. 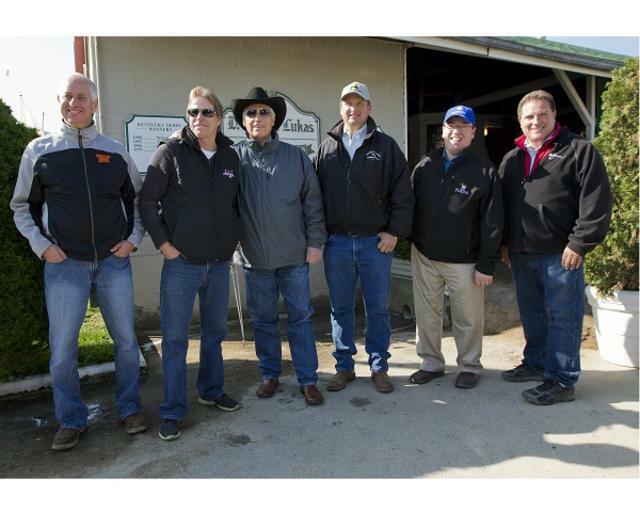 Formerly known as the Homecoming Classic, Churchill Downs officials renamed the 1 1/8-mile race this summer to honor the iconic 80-year-old Lukas – a four-time winner of the Kentucky Derby and Kentucky Oaks who has been based at Barn 44 since 1989 – more than 25 years ago. Lukas, who has conditioned 26 Eclipse Award-winning champions, was hospitalized Saturday in Philadelphia when he wasn’t feeling well while in town to saddle Mr. Z in the Pennsylvania Derby and Take Charge Brandi in the Cotillion. He underwent a procedure there Tuesday to insert a permanent pacemaker. Pletcher was told Wednesday that Lukas might return to Louisville on Friday but was uncertain if Lukas would be able to attend Saturday’s race. With eight horses entered on Belmont Park’s 11-race Saturday card, which includes five graded stakes, it’s not surprising that Pletcher won’t be able to attend the Lukas Classic himself. But the 48-year-old is eager to try Mylute in the 1 1/8-mile race against seven older horses and win the race that honors his former teacher. Mylute, owned in partnership by T. Paul Bulmahn’s GoldMark Farm and Mandy Pope’s Whisper Hill Farm, is best known for his third place finish behind Oxbow and Itsmyluckyday in the 2013 Preakness (GI) while under the care of trainer Tom Amoss. Now age 5, the Kentucky-bred son of Midnight Lute made his first start for Pletcher in May a winning one, prevailing by 2 ¼ lengths in an $85,000 allowance optional claiming event over one mile at Belmont Park. Subsequent starts resulted in a distant fifth place finish in the $500,000 Suburban Handicap (GII) on July 4 and a second to Bay of Plenty in the $100,000 Alydar at Saratoga on Aug. 9. In his last start three weeks ago in the $600,000 Woodward (GI) at Saratoga, Mylute finished fifth and had to face graded stakes-winning stablemates Liam’s Map and Coach Inge, who ran 1-2. Wicked Strong, the 2014 Wood Memorial winner, and Suburban hero Effinex were third and fourth, respectively. Pletcher, who leads the nation in stable earnings for a 10th time with nearly $19 million, has secured the services of jockey Florent Geroux, who is in the midst of a break-out year that includes Grade I triumphs in the Arlington Million (The Pizza Man) and Cotillion (I’m a Chatterbox) plus a trio of $300,000 stakes wins at the recently-concluded Kentucky Downs meeting. The late-running Mylute has a 21-4-4-4—$791,022 career record and will break from post No. 6. He is winless in four starts at Churchill Downs, but ran fifth in the 2013 Kentucky Derby Presented by Yum! Brands when Orb prevailed by 2 ½ lengths. Mylute is scheduled to arrive at Churchill Downs by van early Friday morning and will be stabled in Stakes Barn 17. The Lukas Classic field from the rail out (with jockeys): Hesinfront (Corey Lanerie); Abraham (Joe Rocco Jr.); Ulanbator (Julien Leparoux); Departing (Brian Hernandez Jr.); Irish You Well (Channing Hill); Mylute (Florent Geroux); Smack Smack (Shane Laviolette); and Geothermal (Robby Albarado). Smack Smack, owned by country musician Toby Keith’s Dream Walkin Farms Inc., and Mary Ann Charlston’s Ulanbator are the only Lukas Classic entrants that won their previous start. Smack Smack invades from Oklahoma for trainer Don Von Hemel after posting a half-length victory at odds of 20-1 in the $192,500 Governor’s Cup (Listed) at Remington Park on Aug. 15. The Ian Wilkes-trained Ulanbator beat A.L. Luedtke’s Geothermal by a nose in the $103,150 Michael G. Schaefer Memorial (Listed) over one mile and 70 yards at Indiana Grand on July 18. Wilkes, of course, saddled 2013 Lukas Classic winner Fort Larned, who was the defending Breeders’ Cup Classic champion. Claiborne Farm and Adele Dilschneider’s Departing, a Grade II winner on turf in Churchill Downs’ Firecracker earlier this year for trainer Al Stall Jr., has banked the most money in the field of eight with $1,738,959 from a record of 8-2-3 in 19 starts. Donegal Racing’s Irish You Well will ship from New Jersey for Saturday’s race following a narrow loss in an allowance optional claiming event over one mile on Aug. 22 at Monmouth Park for trainer Wayne Catalano. Abraham will make his second start for owner Brad Grady and trainer Joe Sharp after being claimed off Hall of Fame trainer Bill Mott for $50,000 at Saratoga in early August. Three weeks ago, the 5-year-old gelding was eighth of 10 in the $200,400 Presque Isle Mile over the synthetic Tapeta surface. He won the Schaefer Memorial at Indiana Grand in 2014. Frank Jones’ Hesinfront, trained by Dale Romans, returns to dirt for only the fourth time in his 19-race career and hopes to cross the finish line in first for the first time since June 2014. The first two winners of the Lukas Classic – Fort Larned (2013) and Cigar Street (2014) – used the race as a springboard to the $5 million Breeders’ Cup Classic (GI). This year’s 1 ¼-mile Classic is scheduled five weeks after the Lukas Classic on Oct. 31 at Keeneland. The Lukas Classic, which goes as Race 10 at 5:20 p.m. (all times Eastern), is the richest of three stakes scheduled for Saturday’s 11-race card at Churchill Downs. 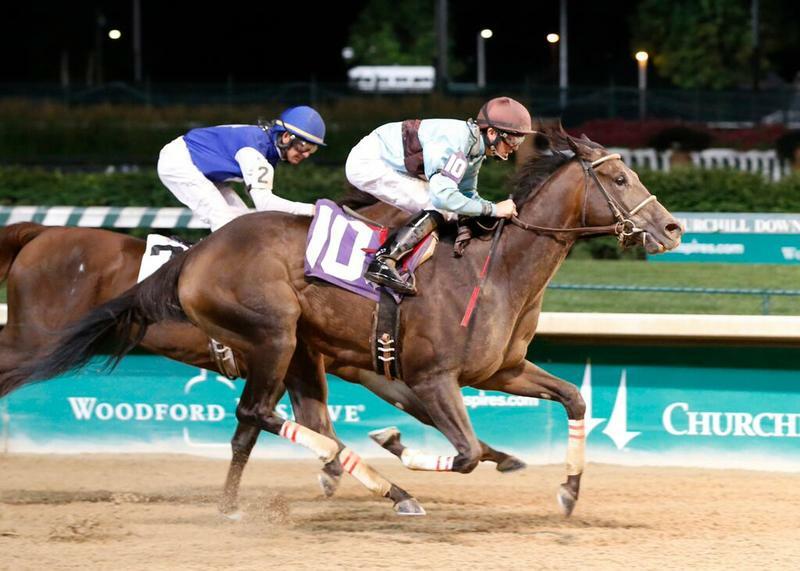 The Ack Ack Handicap and Jefferson Cup – a pair of Grade III stakes – also will be run. The field for the 23rd running of the $100,000 Ack Ack Handicap (GIII), a one-mile race for 3-year-olds and up that goes as Race 8 at 4:18 p.m. (with jockeys and assigned weight): Iowa Sprint Handicap third Den’s Legacy (Calvin Borel, 115 pounds); runaway Kentucky Derby day allowance optional claiming winner Agent Di Nozzo (Joe Rocco Jr., 116); Arlington’s $100,000 Hanshin Cup (GIII) winner and the Presque Isle Mile runner-up Midnight Cello (Florent Geroux, 117); Hat of Jacks (Francisco Torres, 112); 2014 Breeders’ Cup Mile (GI) runner-up and Oaklawn Handicap (GII) and Lone Star Park Handicap (GIII) third Tapiture (Ricardo Santana Jr., 118); $67,750 Kelly’s Landing winner and $700,000 Forego (GI) third Viva Majorca (Julien Leparoux, 116); and Roman Unbridled (Jon Court, 114). The field for the 39th running of the $100,000 Jefferson Cup (GIII), a one mile on the Matt Winn Turf Course exclusive to 3-year-olds that goes as Race 9 at 4:49 p.m. (with jockeys): Canterbury Park’s $200,000 Mystic Lake Derby winner Nun the Less (Florent Geroux); Sylven Park (Sophie Doyle); Cat Humor (Brian Hernandez Jr.); Saratoga’s $98,000 Better Talk Now winner High Noon Rider (Corey Lanerie); Watchyourownbobber (Julien Leparoux); Wayward Kitten (Rafael Hernandez); Delaware Park’s $200,250 Kent (GIII) winner Syntax-IRE (Shaun Bridgmohan); Pride of Stride (Robby Albarado); Flashy Chelsey (Francisco Torres); Wild and Unbridled (Erin Walker); and Parx’s $75,000 Crowd Pleaser Handicap winner Saham (Joe Rocco Jr.). The first race is scheduled for 12:45 p.m. General admission is $3. Reserved seat packages are available for purchase on www.ChurchillDowns.com. Major simulcast races from across the country with Breeders’ Cup implications on Saturday include the $600,000 Joe Hirsch Turf Classic (GI), $400,000 Vosburgh (GI), $400,000 Beldame (GI), $300,000 Gallant Bloom Handicap (GII) and $200,000 Pilgrim (GIII) from Belmont Park, and the $300,000 Awesome Again (GI), $300,000 Zenyatta (GI), $300,000 Rodeo Drive (GI), $300,000 FrontRunner (GI) and $300,000 Chandelier (GI) from Santa Anita. The FrontRunner for 2-year-olds and Chandelier for 2-year-old fillies are Prep Season races on the Road to the Kentucky Derby and Kentucky Oaks, respectively, that award points (10-4-2-1) to the Top 4 finishers in those races. Saturday’s National Weather Service forecast for Louisville calls for mostly cloudy skies with high near 80. It is the penultimate day of Churchill Downs’ 11-date September Meet. Closing day is Sunday.